This tutorial will tell you how to setup a basic mail server and teach you a bit about the Postfix MTA (Mail Transfer Agent) in the process. Postfix is extremely flexible. Its architecture is based on a loose composition of services that receive emails and pass them on to other services (with services like "smtp" on the receiving outer edge, and "local" and "virtual" on the delivering outer edge, if you're looking at receiving mail). Postfix itself implements the core requirements to receive, route, and deliver mail, and relies on third-party extensions to do the rest. Postfix has several hundred configuration parameters. If you want to administer a mail server that reliably delivers business requirements to a sizable organization, you should make yourself intimate with all of them (man 5 postconf). This tutorial will not be enough, on its own, to make you a competent professional email admin. However, if you want to become familiar with postfix or set up a mail server for yourself and a few friends, this tutorial, and the ones to follow, will be your friend. I'm not going to spend a lot of introductory words on dovecot. Dovecot is also huge (here is the wiki for dovecot 2), but we only want a very small set of features from dovecot. This article explains almost every single setting to be set in detail. You can go ahead and skim over the explanations if you want - at your own risk. While any Debian-based OS should be fine, Postfix is in use in a wide array of versions, including Postfix 1.x, Postfix 2.9, and Postfix 2.10, which have some mutually incompatible settings and features - and using Postfix 2.9, this tutorial is not on the bleeding edge. That you are comfortable on a GNU/Linux commandline and with the general layout and working principles of a GNU/Linux system like Debian. By default, commands will be entered and files edited from a rootshell on the droplet. As in most other DigitalOcean articles, parts of commands that you need to customize will be highlighted in red. 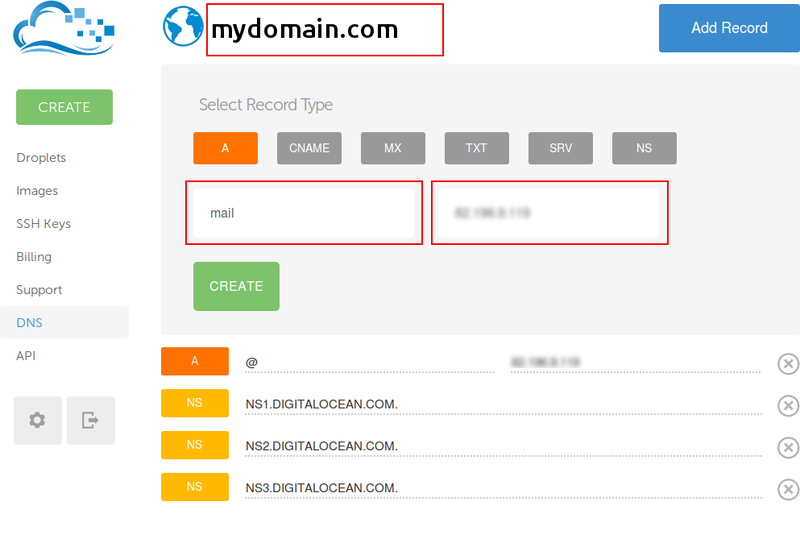 A domain, let's assume it is "mydomain.com"
A hostname for your mail server, let's assume "mail.mydomain.com"
An SSL certificate that is valid for "mail.mydomain.com"
For SSL, you need a certificate and a private key. In this tutorial, we're going to assume that the certificate is saved in /etc/ssl/certs/mailcert.pem and the key is saved in /etc/ssl/private/mail.key. Make sure the key is only readable by the root user! and leaving the default values in by just hitting enter on all questions asked. Don't use this certificate in production! 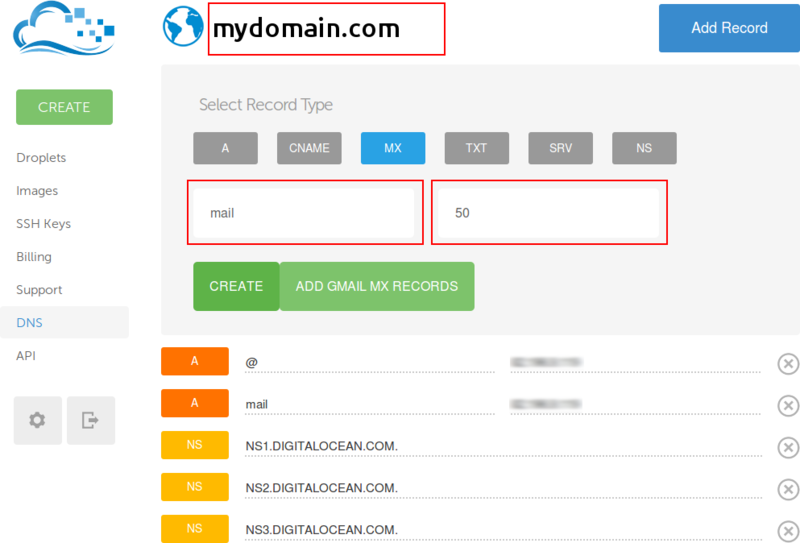 You have to set up your DNS with an A record that points to your mail server IP and an MX record that points to the mail servers hostname. Additional information can be found in the Host Name setup and DNS tips and tricks articles. We will now set up Postfix to receive and deliver mail for local users. The default MTA on Debian is exim. Off with it! We'll also stop postfix after it has been installed, because we don't want it to be running yet. A small insert: Postfix manages its daemons by itself and doesn't need the service (init.d) system. postfix start, postfix stop, and postfix reload are equivalent to service postfix start, service postfix stop and service postfix reload. Postfix has two main config files: main.cf, which specifies what you would think of as config options, and master.cf, which specifies the services postfix should run. First, configure the master.cf file (in /etc/postfix/). Add an extra "smtpd" instance called "submission" that will take mail from trusted clients for delivery to the world at large, which we don't allow for anyone else. This warrants a bit of explanation. The -o ... options override the settings that are taken from defaults or define in the config, which we'll set later. In a nutshell what happens here is that this enables the "submission" daemon with TLS to secure the outer connection, and dovecot-mediated SASL to check the username and password of connecting clients. (We will set that up in dovecot later). The important detail is one that can't be seen: The smtpd_recipient_restrictions is missing reject_unauth_destination, which is present as a default and restricts relaying. Then we move on to main.cf. We'll start with a clean slate here - run cp /etc/postfix/main.cf /etc/postfix/main.cf.orig if you want to save the default config file (it's also in /usr/share/postfix/main.cf.dist though), then open it and clear it out! We set the cert file and the key for it, enable tls, and set the cache files. Then we make TLS optional, because we're not allowed to make TLS required on a public smtp server per RFC2487. We also disallow SSLv2 and SSLv3, so that only TLSv1.0 and higher is allowed (read a SSL tutorial if you want to know why - in a nutshell, SSLv2 and SSLv3 are obsolete). This setting tells Postfix to check a lookup table and reject email to users that cannot be found in the table. This is important because the alternative behaviour, if local_recipient_maps is unset, is to accept mail first and then bounce it later. This causes "backscatter": If postfix cannot determine all valid users immediately (in the smtpd service), like when local_recipients_maps is unset, it will accept mail and then send a non-delivery notice later (when it finds out the mail is undeliverable after it has been handed off by smptd). These non-delivery notices usually hit innocent people whose addresses have been spoofed in spam and scam mails and contribute to the spam problem. to compile the file into the database Postfix uses for fast lookup. This one will be less wall-of-text-y! Take a deep breath, we're almost done. Then go into /etc/dovecot/dovecot.conf and clear out the file again. (that's important this time - the default config includes a bunch of subordinate config files in /etc/dovecot/conf.d that we don't want). This enables plaintext auth (The "plaintext" authentication will be tunneled through TLS), tells dovecot to use the mail system group for accessing the local mailboxes (plus the location of the mailboxes), use the unix authentication system to authenticate users, and enable imap only. Note the angle brackets! They tell dovecot to read from a file. And you should be good to go. Test your config with a mail client, e.g. Mozilla Thunderbird. You should be able to send and receive mails from everywhere and to everywhere! The mail from "root@yourdomain.com" should shortly arrive at "someotheremail@gmail.com" (fill in an email adress you control, obviously). If you reply to it and call mail again, you should see this: (it might take a minute for the mail to arrive). Heirloom mailx version 12.5 6/20/10. Type ? for help. The password you entered here is the password to use for e-mail. Joe can now use the address joe@yourdomain.com with a local mail client like Thunderbird. In Thunderbird, just add a new Account (File -> New -> Existing Mail Account) and enter joe@yourdomain.com and the password in the dialog. If your mail client doesn't auto-detect the necessary settings: The username for the IMAP connection is joe, the port is 143, and the authentication method is unencrypted password via STARTTLS. For SMTP it's the same, but port 587. If anything isn't working, check for error messages in the system log with tail -n 50 /var/log/syslog and in the mail log with tail -n 50 /var/log/mail.log.